Is there a better alternative to Aurorix? Is Aurorix really the best app in Video category? Will Aurorix work good on macOS 10.13.4? 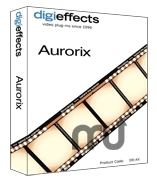 Aurorix is a set of 26 special effects plug-in filters. These special effects plug-ins let you do all kinds of things and are categorized into 5 sections: Media Simulation, Lighting, Distortions, Texture Generation and Pattern Generation. Aurorix needs a review. Be the first to review this app and get the discussion started! Aurorix needs a rating. Be the first to rate this app and get the discussion started!